5 questions you may want to ask yourself | So what? Now what? A couple of months ago, Leanne at Cresting the Hill posed five tough questions that she’d asked herself for the first time. She also shared a link to the article that inspired her query, 50 Tough Questions You Never Ask Yourself, but Should, by Marla Tabaka. After thinking long and hard about the five questions Leanne chose, I am now ready to tackle five more of Tabaka’s questions. I share them with you today, along with the short version of my responses. I’m also including Leanne’s first question, as I believe that answer should guide all of the others. What are my top three values, and do I factor those in when I make decisions? I’ve actually chosen four values in no particular order: 1) health and fitness, 2) cultivating joy, 3) lifelong learning and growth, and 4) nurturing relationships. I do factor these values into my short- and long-term goals, and I aim to do at least one small thing that supports each value every day. Where I could improve is consciously considering my values when I make the many other decisions I am faced with daily. Do I carefully consider other people’s suggestions before I dismiss them? I think I do pretty well at this when it comes to people who are close to me, such as my family and my coworkers. 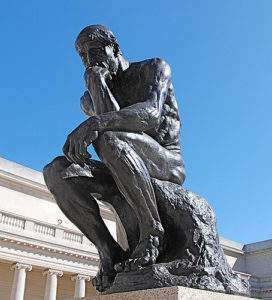 Where I could improve is setting my biases aside to truly consider points of view that are foreign to me; accept the fact that perception is not truth; my way is not always the right way; and there isn’t always just one right way. Am I willing to consider that there are things I can do to improve my life, but don’t have the confidence to take action? What might those things be? This is a tough one. My life is pretty good just the way it is, but there’s always room for improvement. Recently, I’ve been contemplating what I want to do after retirement. There was a time when I thought I would like to be a motivational speaker or a life coach. I certainly don’t want to commit myself to another full-time career, but perhaps if I figure out exactly what it is about those careers that appeal to me, I can figure out a way to tap into that without working full time. More to come. What would I be risking if I did some of the things that are outside of my comfort zone? I risk looking foolish, failing, investing in something that doesn’t work out or that I don’t enjoy as much as I think I would. What am I risking by not doing those things? I risk missing out on something that could be very rewarding. I risk failure to grow and learn. I risk feeling restless and unfulfilled in retirement. I risk getting lazy. What enjoyable activity do I not engage in often enough? I want to hike more this year. I want to attend sangha more often. I’d like to attend more live performances–musical concerts, the theater, and the ballet. I want to see more of the world–travel to places I’ve never been. Do any of these questions speak to you? If you haven’t read Leanne’s five questions already, I highly recommend you check out her blog. Or, if you are feeling really introspective, perhaps check out all 50 of Marla’s questions. In order to create accountability for myself, I will be giving a weekly update of my efforts and progress in the 8-week Transformation Challenge. If you are not interested in this portion of my blog, please feel free to skip down to the Comments. I’d love to hear from you. Workouts. I attended three Orangetheory classes this week. In between the Orangetheory workouts, I did one yoga session, one ride on the stationary bike, one run, and one rest day. Nutrition. Another week of too much eating out. I need to get a handle on this. One week I eat healthy all week, and I lose weight. the next week I eat out too much, and I gain it back. Ugh. I did discover that I LOVE zucchini spaghetti almost as much as pasta! Weigh-in. I gained 0.9 pound this week, for a net loss of 2.7 pounds so far. This post shared on the GRAND Social. Hi, Christie – I appreciated reading your answers to these questions. They speak volumes about your character — and why so many of us follow you! BTW – Zucchini spaghetti is the best. Do you make your own or buy it already prepared? Thank you for the kind words, Donna. I bought these zucchini noodles pre-cut, but now I know I like them, I may look at buying a spiralizer. Thank you Sue. It is good to pause for some introspection on occasion. I look forward to #MLSTL each week. Thanks to you and Leanne for hosting it! Thanks Janis. And have fun hiking! Some fabulous questions there to ponder and you’ve answered them well! I’m in awe that you aspire to be a motivational speaker or life coach but can understand not wanting to commit to a full time job. I look forward to seeing what you might come up with that taps into this aspiration of yours! Thank you Patrick! Have a lovely day. Your post is definitely though-provoking and at times we humans need some of those questions to come our way. Thanks for sharing! Always good to read what you have to say. Denyse, those are indeed important values. I love that you have posted them where you see them often. A great reminder to check in with yourself on occasion. I hope you are doing well. What would I be risking if I did something out of my comfort zone? I would be risking embarrassment, failure, anxiety, possible financial issues. I think the list could go on and on. But, the things that I may gain do outweigh the negatives. Hi Christie – I am so pleased you decided to have a go at these questions – they really challenge you to look a bit deeper don’t they? I found your post-retirement thoughts really interesting – that counterplay between wanting to re-invent yourself and the fear of failure vs the fear of not achieving all that you might be capable of. It’s something I struggle with too. I also liked the idea of taking a little time each day to focus on your core values and to make sure that they get included in your daily life – something we all could do more often. You’re welcome, Leanne. Thanks for introducing me to the questions. I found them very helpful in doing a gut-check of where I am today and where I want to be in the near future. Cheers! Fear is a big obstacle for most (if not all) of us, and yet, all of the really good stuff seems to be on the other side of fear. I hope, for the most part at least, you are busy doing what you love! Those are great questions! We all need to ask ourselves these questions from time to time. I agree, Amy. It’s easy to get caught up in the day-to-day busyness without stopping to think about whether we are going in the right direction. I’m a new reader to your website. The site is very well done and the writing is excellent. You deserve to be very proud of your work and I am amazed that you can do this and hold down a full-time job. Whew! One question on this post intrigued me…”what would I be risking if I did some things outside of my comfort zone”? I had that question before we attempted to travel by RV. I had the desire, but it seemed too complicated, and I was afraid I was too old to learn something new. Nevertheless, on a whim, I agreed to deliver a new motorhome from the manufacturer in Chicago to a dealer in Los Angeles in exchange for the rental fees. When we picked up the RV (nickname Sherman), we were half-crazy nervous, yet giddy with excitement. We spent three weeks crossing the country (not enough time) and by the time we reached California we felt a great sense of accomplishment and were hooked by the RV lifestyle. We blogged about this adventure and titled it Sherman’s March to the Sea. By taking a slight risk, we opened up a brand new world of opportunities for our “Golden Years”. We’re never too old to learn. Hello Joe and welcome! Thank you for stopping by and for taking the time to comment. I appreciate the kind words. Sometimes I do ask myself what I’ve gotten into, but I love blogging so much, I keep going! I love the fact that you pushed past your fear of learning something new and opened up a new adventuresome world. I’m going to have to go back to your blog and look for that first post. I’d love to learn about your early RV-ing experiences. Happy trails! Thank you Jo. It’s good to stop and assess on occasion. I’m happy if I can help remind others as well as myself. Thanks for sharing. Shared on my social media! So good to make us stop and think a bit deeper, thank you for that. I always work to get into my comfort zone. But I learn and grow more when I am outside the comfort zone. I like to challenge myself, which is good but the negative is being too hard on myself when I fail. I hope I am learning not to take things too seriously. All your answers are great and well thought out. It’s funny how we’re so much harder on ourselves than others. If someone we love tries something and it’s not outwardly successful, we don’t criticize them. I try to remind myself that’s it’s not a failure if I learned something. Still it is a real challenge. Thanks for taking the time to share your thoughts. Some tough questions, well answered. I do hope that you figure out why you want to be a motivational speaker and then go ahead with it. I may try some of Leanne’s questions myself. Shared on my social media. Hello Kalpana and welcome! Thanks for stopping by and taking the time to comment. I’d definitely check out the questions on Leanne’s blog. Perhaps read the full 50 questions and choose a few that speak to you. It can be quite enlightening! Have a lovely day! I like this list. Thank you for sharing your responses. Oh, and I do the same thing with the eating really well one week and then messing up the next. Makes for a difficult time losing weight. Thanks for sharing your values, Laura. It would appear we have much in common. 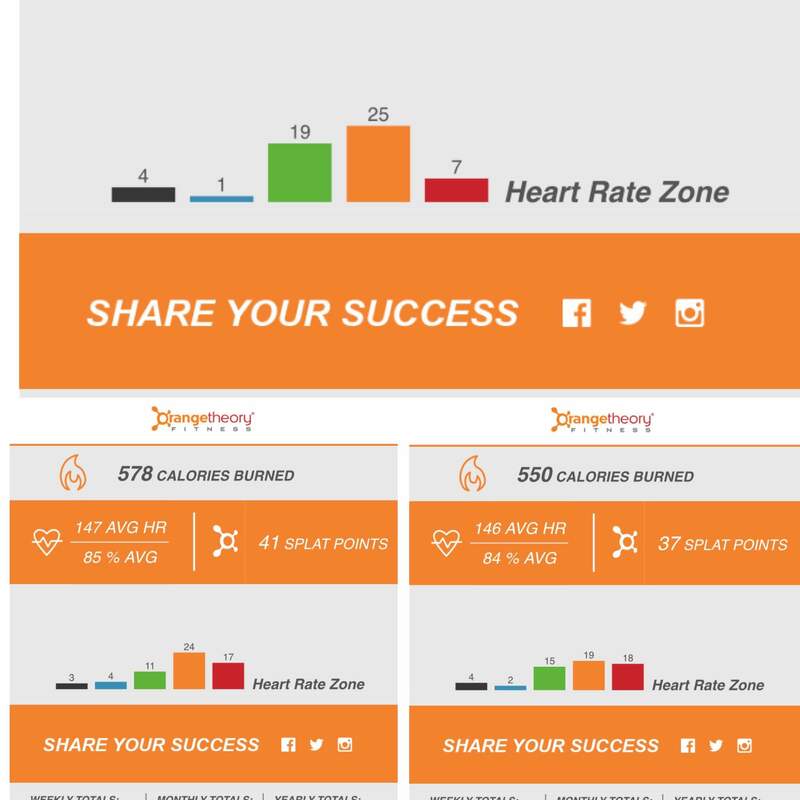 Orangetheory is a high intensity interval workout done in a group setting with a coach. 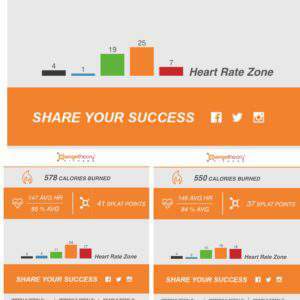 Everyone wears a heart rate monitor, and the goal is to spend a minimum of 12 minutes in the “orange” zone. I’ve really enjoyed it. I’ve made some vast improvements in my home eating recently, but all that eating out is tough. Progress, not perfection, huh?